TSC Auto ID Technology is a world-renowned and fast-growing Taiwanese vendor of thermal label printers and quality Auto-ID hardware for transportation, logistics, manufacturing, healthcare, industry and retail. In its comprehensive portfolio you will find budget-friendly market-entry models as well as high-performance printers for the industry. They therefore produce wristbands for events and concerts, high resolution labels with graphics and barcodes, shipping labels, and special labels for patient ID tracking, document management or inventory control, to name just a few examples. 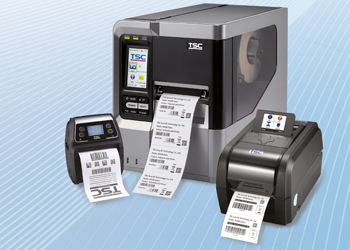 Since its establishment in 1991, TSC has sold more than four million label printers – proof not only of the high quality of the portfolio, but also of its wide range of use. Despite the strengthened market position, the company continues to evolve and constantly incorporates new experiences into the development and production of its devices. The result is products that combine a high degree of user-friendliness with high-quality print results – something truly unique! TSC manufactures in its own production facilities. As one of the top five barcode and label printer vendors, the company has offices across the globe, including China, America, Europe and the Middle East. At Jarltech you receive the entire TSC portfolio of label and colour printers, as well as print engines. Benefit from the company's almost 30 years of experience and introduce your customers to a comprehensive range of robust thermal label printers with a convincing performance-price ratio. Additionally, Jarltech also provides you with consumables, such as thermal transfer ribbons, labels, receipt paper and wristbands, directly from stock.